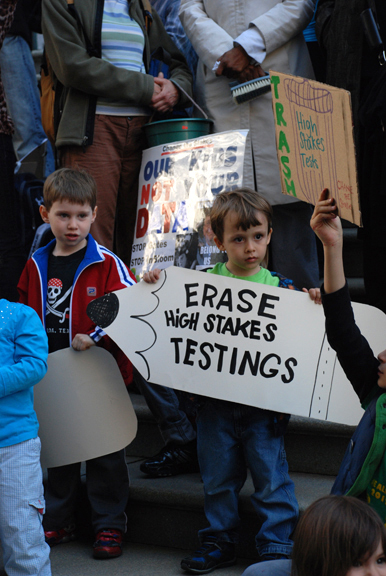 High stakes testing - the civil rights issue of our time. You don't get 500 people out to a rally without organizing or an organization to do the organizing. 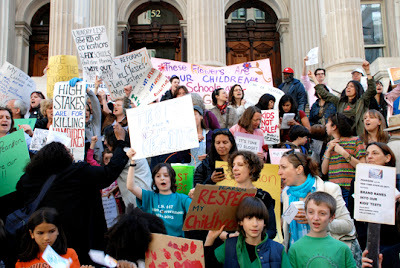 This is the face of social justice unionism, an event at which Unity and New Action were absent. Change the Stakes was the outgrowth of the work of GEM as has been MORE. Both groups work together. CTS joined with Parent Voices and Time Out From Testing to put this event together. More are coming and we expect the MORE caucus, now that elections are over, to be MORE involved in this movement. 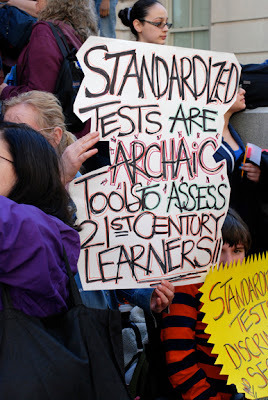 The entire structure of ed deform and the assault on teachers and children emanate from the high stakes testing agenda. 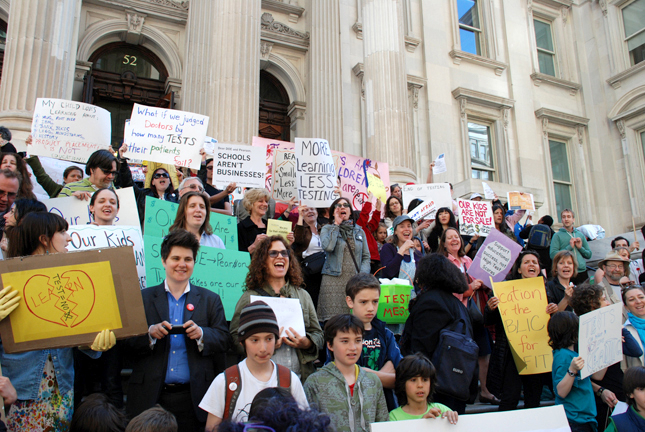 Note the vicious attacks on the editorial pages against parents who are opting out. 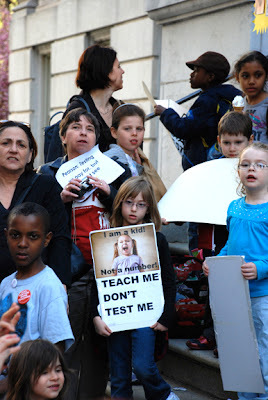 They cannot blame the teachers for this one, so instead they attack the parents. 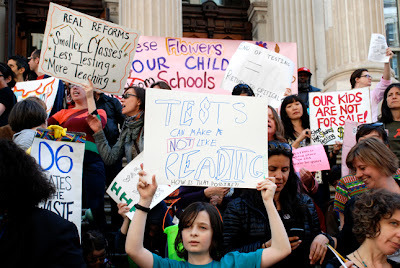 So far this movement has come from the white middle class public school parents but people of color, especially in poor communities are taking note of the negative impact of HST on their children and are beginning to join in, the worst nightmare for the ed deformers. Photos by Michael Solo (John Dewey HS) and Pat Dobosz (PS 157K). Friday many of us in MORE attended one of the best rallies we've been part of on the steps of Tweed which were packed with parents, teachers and children protesting high stakes tests with many MORE tee-shirts in the crowd. Change the Stakes has emerged out of a committee set up by GEM 2 years ago and has grown into a powerful parent advocacy group. The other teacher oriented arm of GEM inspired and helped organize MORE. Both CTS and MORE are more or less sister organizations but over the past year have not had the time to work as closely together as we should, though I and some other MOREs have been deeply involved in CTS. Below some pics with lots more later in a follow-up and maybe some video tonight. The UFT had zero presence. 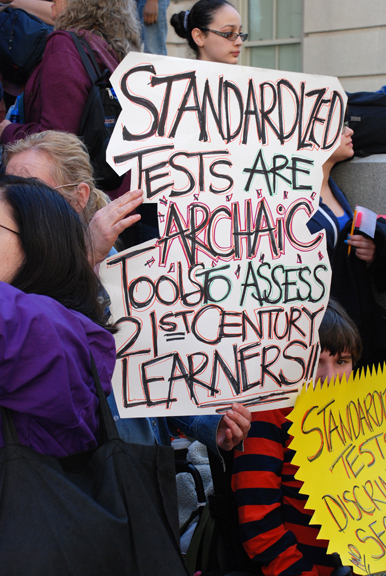 When I was asked why I said, "Because the UFT supports high stakes testing." A really good time was had by all and afterwards over a dozen of us went to a local diner to chat about the UFT election results. Here are some reactions and photos with video to follow in a few days. Thank you fellow MORE comrades who showed up in numbers and in spirit today! Police estimated that there were approximately 500 in attendance! 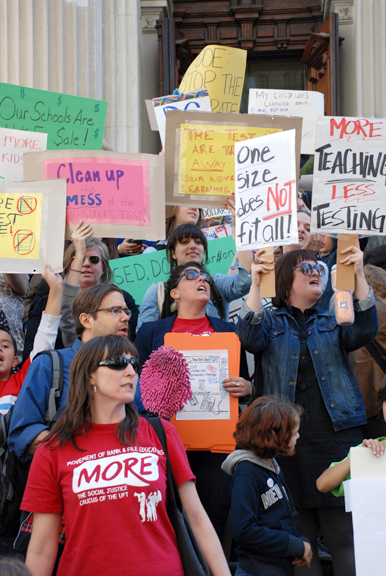 This was not just a parent movement, this is a parent/teacher movement! I am prompted to write this because of a few questions that have come my way about how this all happened. It is my belief that no matter the conditions at our schools, if we build relationships, the very basic component of a community, we can build this movement across groups. I have many ideas, but I'd love to have this discussion with anyone who's interested. "Our strategy should be not only to confront empire, but lay siege to it. Great wonderful time on the steps of Tweed. I heard police estimated about 500 people. And they were 500 charged up people, really a beautiful day. If anyone has images, moving or still, but preferably moving on their cameras or phones, please send to me or directly to news12bx@news12.com so they can put them in the 10 or 11 pm slot. I think they are looking for a modest amount of footage --A few minutes should do it. Please call or email me and I will let them know it's coming. They already interviewed some parents (in the Bronx) this afternoon. A beautiful day--and this is only a start! Near the end, seeing the kids on the nearly emptied steps, racing around, was such a sight, bringing some life into that stony building. ps attached is the press release. many thanks to all who contributed. I want to send out huzzahs! to everyone. What a wonderful, warm, passionate crowd! Janine was great both as organizer, speaker, and mop. Jane H was great as organizer, of course, & on the scene about changing the chants (to good ones too) just as the current one lost steam. Jane M - ditto about organizing, getting calls out to press (even if not enough showed up - but they'll start coming more & more, right? ), & cheering people on, with & without the new press release. Parents whose names I don't know (at least I don't remember 'em) were great for showing up, for standing up for what they believe - smiling yet - & some of them for telling their powerful powerful stories. Teachers like Gia & Lauren who would rather put their jobs on the line than shoot down their own principles: kudos! AND THOSE KIDS: hallelujah to them all! You are all so strong! & even though it's a cliche, I'm gonna say it: so beautiful too. I asked one boy how his test week had gone, & he said he hadn't taken the tests. And how was that? I asked. He shrugged & said, Well the whole blending in thing was a bit hard, but ... Was he the only one? I asked. Yes, he answered, that's what I meant about the blending in thing. Thank you everyone for this wonderful experience! We didn't know what was going to happen and look what our passion and love for our children has brought us. I posted this quote by Arundhati Roy on FB. It's one that I've been using as a mantra almost. Congratulations on the fantastic Rally! 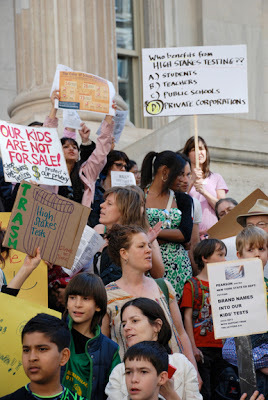 You created an exciting event that helped join many groups against the DOE. I look forward to more unique opportunities to show our solidarity. It was wonderful to see so many familiar and new faces in the crowd. The best part was the 'kid friendly' atmosphere. Special thanks to the tireless rally leaders! The rally was great!! Everyone was marvelous. It was well organized. Lots of people, old & young. Lots of energy; the band was a good touch. A dramatic conclusion to weeks of intensive effort on dealing with the tests. I was happy to be part of it. Thanks to all who worked to put the rally together. 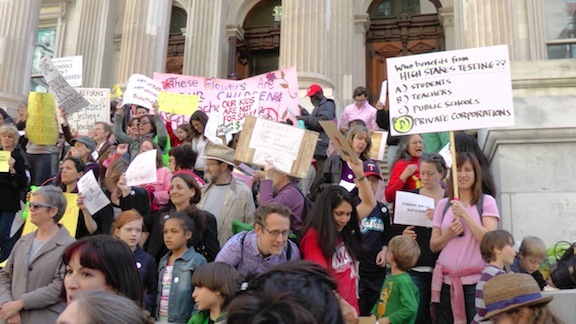 I have been to many rally rallies in front of Tweed, but this one was one of the biggest and certainly the best with so many children. The children are really who it is about after all and the kinds of lives and knowledge they will grow up to have (partly based on the learning they experience). When I rounded the cornor of Chambers street and saw the steps of Tweed filling up, it was such a great feeling. When is the next CTS meeting? Let me add my gratitude and appreciation to ALL the CTS and others who organized and ran the rally. It was super! So many children and GREAT chants and the band - AWESOME! Thank you all; I have some good shots on fbk and some footage, which I can send tonight to anyone who needs it. Congratulations to all the organizers. I have been to more rallies than I can count and this was one of the best. The diversity of children, parents teachers, educators and others interested in education but not necessarily working in schools was amazing. This was democracy at work, speaking out freely and loudly. I will be sending out pictures of the large group, the signs and those wonderful mops. Estimated the crowd at 200 when police said 500 -- thanks for correcting them Fred! "excellence for something" with their claims of 5000 people attending their events? Change the Stakes need to add some version of "excellence" to its name and get money from Walmart.